I also knew I wanted to be more intentional about prayer in 2017. To that end I found and printed this beautiful monthly prayer journal. It’s got space to jot down various prayer concerns and thoughts throughout the month in different life categories. It has become such a delight to look through it each morning and has reminded me to make note of answered prayer as well. It has really helped to keep me focussed in my time alone with the Lord and has helped to guide my thoughts and words as I lift my heart with all its burdens to Him everyday. If you’ve been looking for something similar, check it out. It’s a free download. I’ve also been enjoying a collection of quotes on prayer from Oswald Chambers. Found this little gem for $1 at our local library. 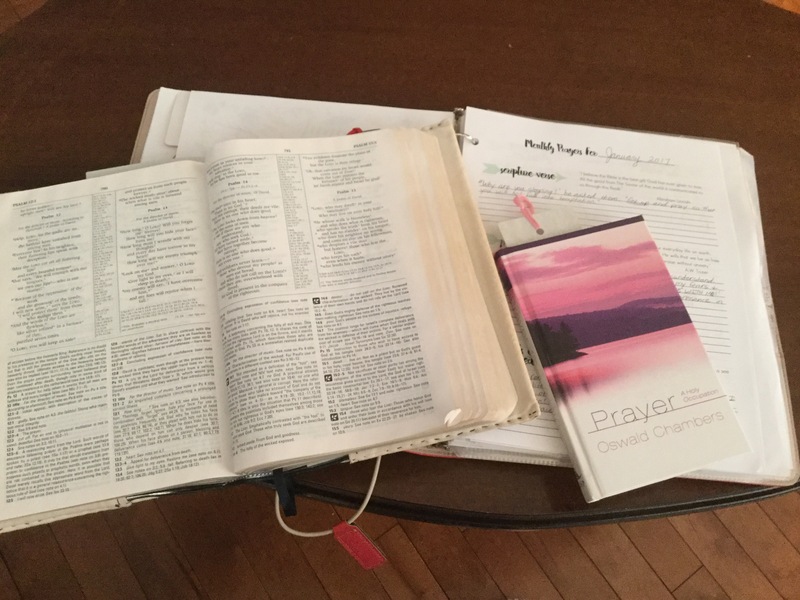 Each page has two quotes about prayer from the writings of Oswald Chambers as well as a question for personal reflection. One last book I’ve been reading daily in my quiet time is called A Diary of Prayer by Elizabeth Goudge. There is a prayer or poem to read for each day of the calendar year, collected from a wide variety of Christian traditions. I know our prayers don’t need to be beautifully crafted with eloquent words for God to hear them, but these short prayers bless my heart with their beauty and give words to my own longings that I sometimes can’t articulate. This has been my challenge lately. When the alarm sounds in the early morning and I’m tempted to just roll over I remember “Get up and pray”. And I won’t deny it – this new electric fireplace has made getting up on these chilly mornings a little easier too! It’s a cozy spot to start the day. 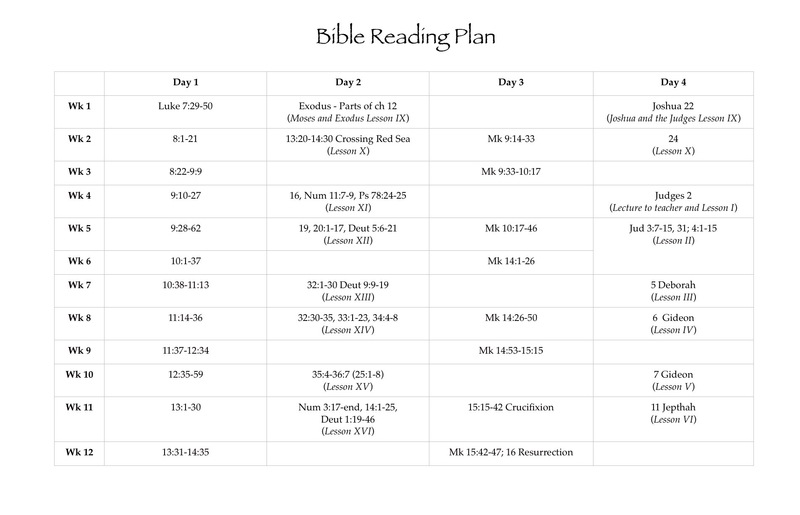 I love your idea of pre-reading your children’s Bible reading for your own personal devotions. Thank you for sharing that — I’m going to think on that more for my own spiritual practice. I’m loving it. Although I have to laugh at myself when my daughters begin their oral narrations sometimes. 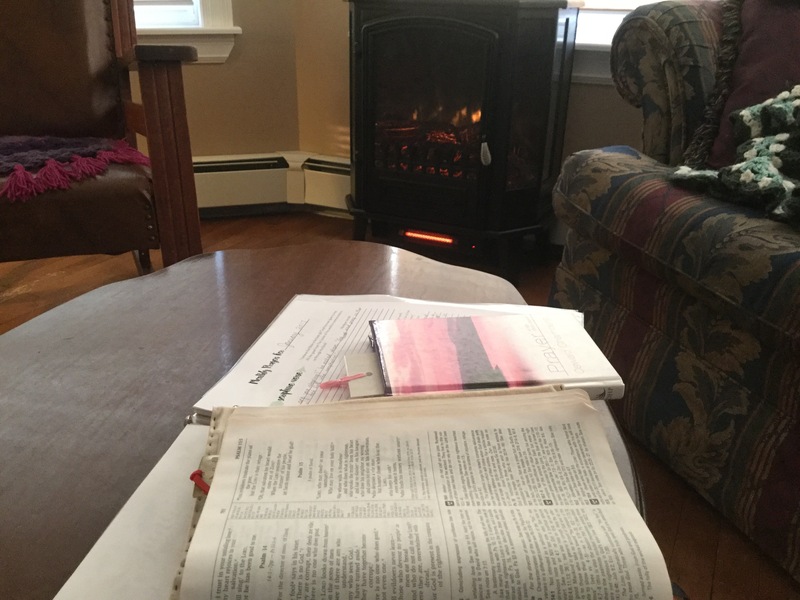 I’m just about to say, “Hey, I read that same passage today in my quiet time”…then I remember, yes, of course, I planned it that way!